This was the first in the series of three clocks to be constructed on the Unimat 3 lathe. The project was intended for the beginner and the first chapter of the manual is devoted to preparing the lathe for use. ie. grinding the lathe cutting tools, making a simple lathe tool honing jig, a tool height setting gauge, a chuck board and generally getting started. 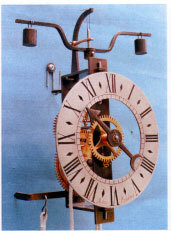 The clock employs the verge escapement and has a single hour hand. It runs for 30 hours on a winding. No other machine tool was used for the construction and all the wheels were cut on this lathe. This attractive clock is wall hanging and needs to be some 6 feet above floor level for the full period of running.